It was a beautiful sunny day when a friend and I recently walked along the Clinton River, Day2 Milford Sound track NZ, on the way to Mintaro Hut. 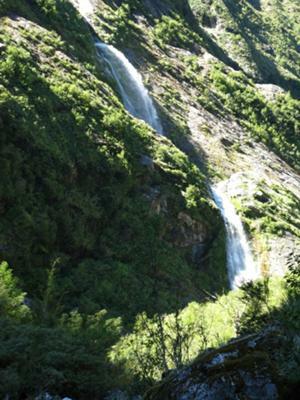 We had very early on noticed the Hirere Falls jetting out like a fire hose from the mountain. After passing the guided walkers’ stop-off at Hirere Hut, we had lunch at the Clinton River, off the main track. After a nice swim, we found a dry river bed in the direction of Hirere Falls and followed that, coming out at the base of the Falls. What a surprise! We were able to climb up to where the second to last section of the waterfall landed in a pool, in which we could swim. We had a beautiful view of the Pompolona icefields, the Dead Lake and the rest of the valley. It was an absolute unforgettable experience.